Are they from the North or are they from the South? Some think these fried cornmeal "johnnycakes" were originally called Journey Cakes while others believe they were first called Shawnee Cakes after the tribe in the Tennessee Valley. According to The Encyclopedia of American Food and Drink by James Mariani, the name, "Rhode Island johnnycake" first appeared in print in 1739, and an 1835 political cartoon by James Akin called johnnycake "the stamina of the south." 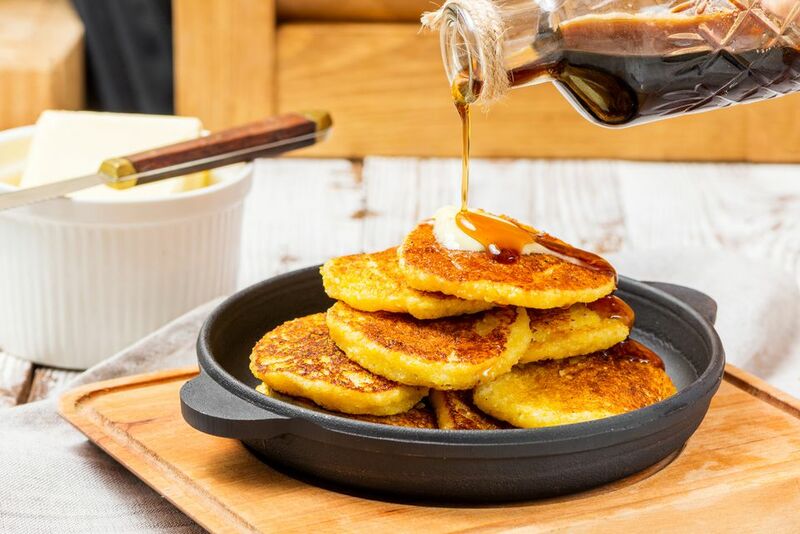 They're very similar to a cornmeal pancake, and they are delicious with maple syrup, cane syrup, or Southern sorghum syrup. Or serve them as a savory bread along with beans or greens. Heat the milk with the butter until the mixture begins to simmer. Combine the flour, cornmeal, sugar, baking powder, and salt. Whisk to blend. Add the hot milk mixture to the dry ingredients and stir to blend. Whisk in the beaten egg. Drop onto a hot, greased griddle or drop in an iron skillet and fry until golden brown on both sides. Serve hot with butter and syrup as for pancakes, or serve them as bread with butter. If you are making batches for a crowd, preheat the oven to 200 F before you begin. Put the finished pancakes on a baking sheet and keep them warm in the oven while you make subsequent batches. Fry the johnnycakes in hot bacon drippings and serve with bacon. Decrease or omit the sugar if you prefer a more savory johnnycake.